The Battery is a landmark defensive seawall and promenade in Charleston, South Carolina. Seating on the peninsula, bordered by the Ashley and Cooper Rivers, on East Bay Street. The most famous tourist destination featuring the most luxurious, upscale mansions, from The William Ravenel House, to Charles Drayton House. The battery also features White Point Garden, knows as Battery Park, statues, cannons, cannon balls, oak trees, lots of palmetto trees. Most tourist & locals love taking a stroll or jogging to view the homes and the amazing view of Fort Sumter, the Sullivan Island Lighthouse, Castle Pinckney. Wedding clients love this location, when possible and if my clients have a great photographic designed timeline looking in having the Charleston theme as part of their wedding, it is always a possibility to accomplish. 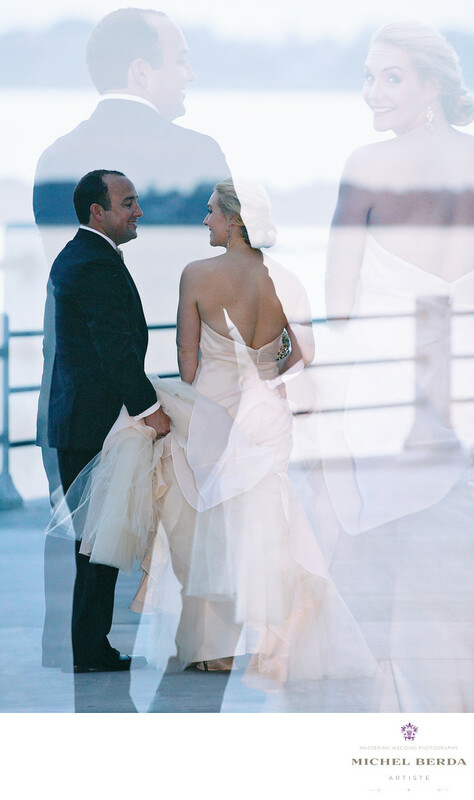 For this wedding that took place on New Years Eve, we ended up here at The Battery Gardens for our second location. For me, I love capturing different more artistic wedding photography, and this images speaks that to every clients looking for art, that is what I create. I could not settle for just one exposure and it just seemed perfect that while you see thousand if not millions, of the same exact photo, of back the bride and groom walking together, I gave it a little twist by adding a second images that speaks the passion for the art. To me a unique and fantastic image. Keywords: bride (66), Charleston Wedding Photographer (24), groom (69), nye wedding (3), south carolina (24), The Battery Gardens (3), Wedding Photographer (1254), Wedding Photography (123), white point gardens (3).